← O Christmas Tree … Go Christmas Tree! So you think you know Westport? Whether you’re a native, a newcomer or an expat, “06880” is introducing a new feature we think everyone will enjoy. Each Sunday at noon, we’ll post a photo of some place in town. It may be vaguely familiar, or a close-up of a spot you see every day. Lynn U. Miller — a longtime Westporter, Staples grad, very talented photographer and good friend — will provide the images. She’s got a great eye for finding offbeat angles, and obscure parts of familiar scenes. Your job is to figure out where it is. Click “Comments” to be the 1st to nail it. If someone beat you to it, feel free to add some thoughts on what that particular place means to you. It’s the end of a holiday weekend, so we’ll start with an easy one. Enjoy! Lynn U. Miller describes herself as a “chronicler of family, friends and events.” She started on that path at Kings Highway Elementary and Bedford Junior High Schools. She still has some of those photos — along with a few old Instamatics. Growing up surrounded by art, and viewing this town (and the world, and life) through a lens, she documented the ever-changing Westport landscape. She looks forward to showing future grandchildren pictures of cool places around town. Lynn graduated from Staples in 1971, and Arcadia University in 1975 with a major in English. She lived in New York City, and met her husband Jason in their building. They moved to Annapolis after marrying in 1980, and moved back here to be close to family. “I’m a big fan of Westport: the town and the people,” Lynn says. Lynn is a frequent contributing photographer to WestportNow.com. Her favorite pastime is using the computer to create altered images and collages. Lynn and Jason have 3 children: Meghan, who lives in Branford; Daniel, and Andrew, a junior at Roger Williams University. Lynn’s father, Larry Untermeyer, is a well-known Westport photographer. This entry was posted in Photo Challenge, Places and tagged Lynn U. Miller. Bookmark the permalink. Maybe at the beach where the showers are ? Yep — old Y, on the corner of the Post Road and Main Street. With the ivy removed, the gargoyles come out to play. Future “Oh My 06880” photos will be much more difficult! Besides her wonderful photos, what I think of most when I see the name Lynn Miller is her uncommonly genuine, warm, beloved, and much missed mother Nikki Untermeyer. I was so glad to know her and I’ll always remember her. Love the new feature. And perhaps Lynn would also be willing to share some of her vintage photos with 06880. Yep. It’s the front of the old Y. Today I’d have to call this part of the Y “The Really Old Building.” That’s because, when I worked for the Y in the 1980s/90s, we called this oldest portion (sitting at the corner of Main & Post Rd.) “The Old Building.” It was old compared to the newer portion of the Y which we called the “New Building” (its true name was the Week’s Pavilion). Now the “New Y” is at the Y’s vintage Mahakeno, the old “New Building” (the Week’s Pavilion) is headed for the dump, and the “Really Old Building” thankfully remains in place, gargoyles and all. That’s the gargoyle on front of old Y. Oops I guess everyone beat me to it. Oh well. Old YMCA bldg main and post. My comment is very late, just got in from church. IT IS THE OLD Y.
YMCA downtown over the doors of what used to be the main entrance yo the building. Opposite Dovecote. Isn’t that one of the newly visible gargoyles outside the old Y? Old YMCA, comments confirm my guess! since you pointed this out a few weeks ago – was this a short term memory test? Kind of. Wait — what was the question again? Dan did write that this would be an “easy one”, and so it’s easy to have a bit of fun. p.s. Seriously, this is a great way to go back and read posts about subjects like the Y’s gargoyle, to find out whether it was a working gutter system, or just ornament. It’s from the Old YMCA! What a fun idea plus we get to see Lynn’s wonderful pictures! Thank you, 06880. YMCA gargoyle on the entrance of the YMCA!! Everyone beat me! 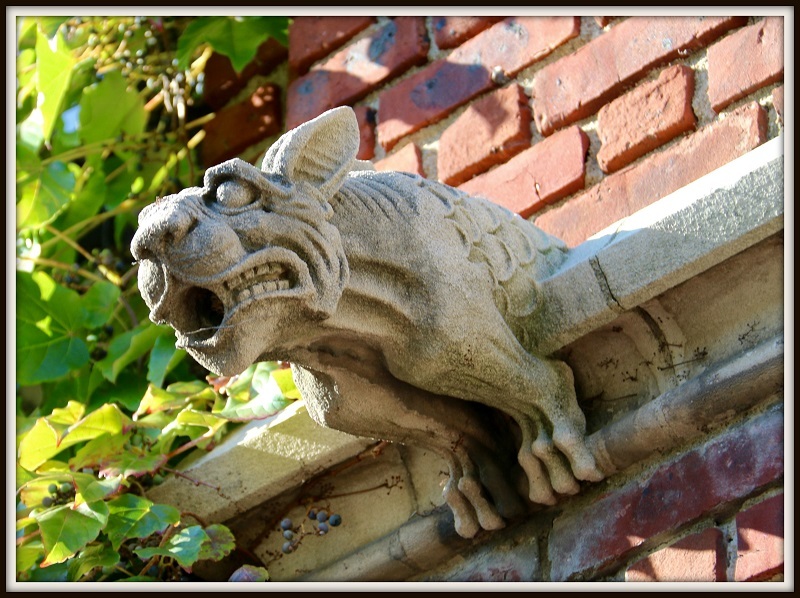 Trivia which residential home has two gargoyles at the gate. Hint: the owner is a celebrity! Gargoyles at a gate makes no sense. Lions, yes. That’s Paul Newmans. There a home with gargoyles at the gate in Westport. Really? I once went trick or treating to the house… no memory of gargoyles, or a gate. I guessed it was the old Y building but am writing to say what a fun idea for the new year and to give my best to you Dan, and to Lynn Miller, a long friend and excellent photographer! I was late guessing, but I got it right before checking the comments. Looks like every Sun at noon some of us will be glued to 06880 to guess and then check. Nifty feature.